Which is better, using a printed text book or digital e-book? This is a question every college student wonders heading off to school. E-books are inexpensive and convenient on your laptop. Text can be quickly searched and there are plenty of apps for note taking and sharing. But do students actually prefer them over traditional printed versions? According to recent studies, more than 90 percent of college students prefer printed books over digital versions. Do they actually learn better with traditional print? Here are some factors to consider before making your choice. This preference for traditional books over e-books is definitely not reflected in the market trending to enterprise mobility. Show us a student that doesn't have a smartphone and other connected devices. The study, which interviewed students in four different countries, revealed a number of intriguing reasons for this tilt towards printed reading materials. Several respondents stated that the likelihood of distraction is higher when reading digital material. Staring at a screen for any length of time does make you tired quicker, and there is the added diversion of your social media page or a YouTube video being just a click away. Digital media has a completely different feel about it, you just do not get that familiar book sentiment which can be gratifying in itself. Further research has gone on to suggest that e-readers and e-books could negatively affect how we comprehend what we read. The experiment measured how much information was retained by students reading the same material in print and digitally. This essentially leads back to the distraction problem, with e-readers and i-tablets having an array of gimmicks and flashy sales designs which detract from their actual purpose, to convey information. Simply finding the same page in class can be problematic on a digital device, with the need to navigate the software, keep the battery charged, and find a plug for it. Many complaints about e-readers is the clunky page refreshing and the inability to highlight text properly. Zooming in is also a chore compared to reading print where it is more of a manual operation. You will have to update and learn a new software system to use one, but everyone knows how to operate a text book. Then there are the different file standards that each company uses to lock you into their own system. On the upside, there are a number of advantages e-readers have over print. A search function for one. While an index or appendix will do the job, it's far quicker to type what you're looking for into a search box. Access to photos and sound allows you to immerse yourself in your subject material. Books, especially college reference books, are big, heavy and cumbersome. 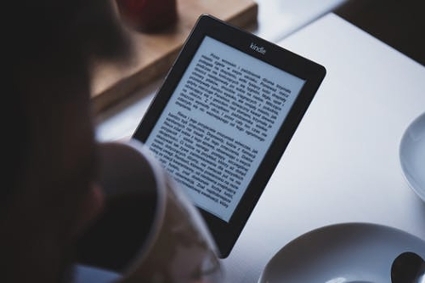 An e-reader can fit literally thousands of them into a space smaller than an airport novel. You also have the ability to share and download new books at the click of a button. Eco warriors can look at the environmental benefits of not using all of that paper, but that can be countered with the use of electricity to power them. "More people are even turning to audio books as an additional solution, and I am certainly one of them," says the Founder & CEO of e-commerce startup Rukkus. Although much easier to be distracted while listening, they can provide useful insight in place of otherwise uninteresting background noise. In general, it does look favorable for traditionally printed textbooks when it comes to remembering information. You are less likely to be distracted with a book but the convenience of an e-reader could see you choosing both. Books are no more threatened by Kindle than stairs by elevators - Stephen Fry.